Is there a more important priority than safety for any business? Safety problems affect companies on many levels – employee health, company culture, productivity, profitability – and even one injury can have repercussions all throughout the enterprise. That’s why on-demand safety-related information is critical for performance support applications. 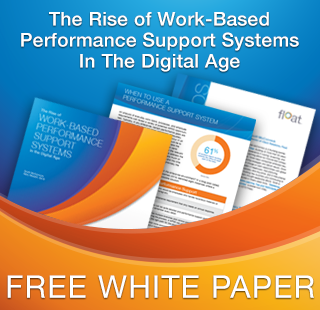 Recently Float released the white paper, The Rise of Work-based Performance Support Systems in the Digital Age. In it, I present the mobile application Safe Site for Forepersons as an excellent example of mobile performance support. This Apple/IBM product is an iPhone and Apple Watch application that keeps employees and managers consistently updated on critical safety information throughout their facilities. It’s valuable and even necessary. But why does the new process also need to be implemented? What are the advantages over the existing routine? We already know the business problem here – essential, perhaps even regulated, safety information needs to be top of mind and available to specific employees who need it to get their jobs done. We can also assume that the information is already being distributed in some way either through a dated technology or an even older “platform” like a laminated sheet stuck to a wall or the side of a machine. So, how do we take this process to a new level of effectiveness? Safety issues are answered more quickly. Safe Site for Forepersons takes advantage of an essential attribute of the devices: location services. The application always knows where it is in the facility. If there is an issue reported, the device takes care of reporting where on the scene person is so that a manager or responder knows precisely where to go. The application interacts with beacon technology and the device’s GPS to report a reasonably accurate location where a safety problem is occurring. This is ideal because this essential bit of information may be incorrectly reported by a person in a potentially stressful or even chaotic situation. The emotionless device is continuously reporting and goes about its business no matter what the situation. Safety issues are answered more accurately with better detail. The application utilizes the device’s camera, resulting in a higher degree of accuracy in reporting the safety issue. It is not always the case that an SME in safety standards is doing the reporting so if the device user can send a photo of the possible infraction, it can be reviewed by an expert and a proper response can be implemented. This type of networking allows expertise to be shared across the enterprise. The camera can also potentially show conditions that may not be included in a text report. The application creates a two-way dialogue of safety information. In addition to reporting, Safe Site allows for push notifications that can be successfully utilized in many ways. For instance, if a safety hazard is reported, the problem can be immediately reported to everyone in the facility who could potentially be affected. A quick notification to all connected devices could be the difference between protection and danger. Push notifications can also be used to send reminders. Perhaps it is time to start an inspection, alert forepersons of a shift change, or follow up with a check-up on a piece of equipment. Push notifications provide help in the accountability for meeting all safety standards and requirements and can instantly push up-to-the-minute information to the forefront of the user’s screen. With appropriate settings, the device can vibrate or sound an audio alert when a notification is sent. The application also has an Apple Watch version, which is an ideal form factor for notifications. A vibration in the watch can alert an employee in the midst of their job tasks while still allowing them to be hands-free. Analytics makes the app – and the users – smarter and safer. Wherever data is accumulated, there is the potential for growth and learning from the data. The application reports safety information of many types which can all be gathered to produce predictive analytics. If a certain machine has had chronic problems, the app can make suggestions to prevent the problem from recurring. Or if a particular safety problem has happened multiple times, it can recommend certain preventive actions if the symptoms of that problem show up in a new location. Analytics can also keep track of enterprise safety records that are needed for regulatory reporting or employee and plant accomplishments. The more data the device collects, the more the users can make educated decisions on important safety matters. It is no secret that companies of all shapes and sizes need to leverage the mobile and wearables platforms to keep their employees informed and equipped. You can see the potential of mobile content delivery in this wide variety of applications. These specific apps may be outside of your budget, but they can certainly spur ideas on how you can reach your workforce with useful and on-time information. Your creativity in using the mobile platform could lead to safer and happier employees. Thinking safety first? Try thinking mobile first. 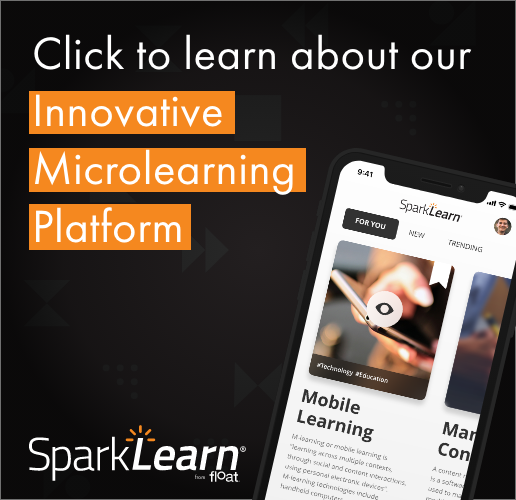 Use the comments section below to share your ideas, perspectives or experiences in using mobile devices or wearables to meet safety challenges or tasks, especially if you have used Safe Site for Forepersons. And, don’t forget to download our latest white paper that talks about work-based performance support systems in the digital age. In it, we talk about how performance support systems have matured over the past quarter-century, when you would use such a system, and how we think they’ll continue to evolve in the future.